Sligo 2-7 Mayo 1-4 (Tubbercurry, 14/2/1971). MAYO: E Rooney; P Kelly, R Niland, C Dolan; J Carey, J Morley, B O’Reilly; J Langan, T Morley; T Fitzgerald, JJ Cribben, R Corcoran (0-4); D Griffith, S Kilbride, J Nealon (1-0). Sub: PJ Loftus for T Morley. Mayo 1-10 Down 1-7 (James Stephens Park, Ballina, 12/3/1971). MAYO: E Rooney; J Earley, R Prendergast, R Niland; J Carey, J Morley, B O’Reilly; J Langan, S Kilbride (0-1); T Fitzgerald (0-1), S O’Dowd, J Corcoran (0-6, five frees); J Nealon, W McGee, JJ Cribben (1-2). Sub: D Griffith for O’Dowd. Louth 1-6 Mayo 1-10 (Drogheda, 4/4/1971). MAYO: E Rooney; S Hughes, R Prendergast, J Earley; J Carey, J Morley (0-1), B O’Reilly; J Langan, S Kilbride (0-2); T Fitzgerald, R Niland (0-1), J Corcoran (0-3, two frees); J Nealon, W McGee (1-0), JJ Cribben (0-3). Sub: D Griffith for Fitzgerald. SEMI-FINAL: Mayo 1-9 Dublin 0-8 (Croke Park, 24/5/1971). MAYO: E Rooney; S Hughes, R Prendergast, J Earley; J Carey (0-1), J Morley, B O’Reilly; S Kilbride, J Langan (0-1); T Fitzgerald, R Niland, J Corcoran (0-5, three frees); D Griffith (0-1), JJ Cribben (0-1), J Nealon (1-0). Subs: S O’Grady for Langan, S O’Dowd for Niland. FINAL: Kerry 0-11 Mayo 0-8 (Croke Park, 20/6/1971). MAYO: E Rooney; S Hughes, R Prendergast, J Earley; J Carey, J Morley, B O’Reilly; S Kilbride, PJ Loftus; T Fitzgerald (0-1), J Gibbons, J Corcoran (0-7, frees); W McGee, JJ Cribben, D Griffith. Subs: S O’Grady for Kilbride, R Niland for O’Reilly. FIRST ROUND: Mayo 5-7 Leitrim 2-4 (Fr O’Hara Park, Charlestown, 13/6/1971). MAYO: Eugene Rooney; Ray Niland, Ray Prendergast, Joe Earley; Johnny Carey (1-1), John Morley, Brian O’ Reilly; PJ Loftus (1-0), Sean O’Grady; Tom Fitzgerald (1-0), John Gibbons (1-0), Joe Corcoran (0-4); Des Griffith (2-0), Willie McGee, JJ Cribben (0-1). SEMI-FINAL: Galway 1-7 Mayo 0-7 (Tuam Stadium, 27/6/1971). MAYO: E Rooney; S Hughes, R Prendergast, R Niland; J Carey (0-1), J Morley, J Earley; PJ Loftus, B O’Reilly; T Fitzgerald, J Gibbons, J Corcoran (0-5); D Griffith ,W McGee, JJ Cribben. Subs: J Nealon (0-1) for Griffith, S Kilbride for McGee. Mayo 2-16 Antrim 3-4 (MacHale Park, 17/10/1971). MAYO: JJ Costello; J Earley, J Mellett, T Keane; M Begley, J Carey, B O’Reilly; S Kilbride (1-3), S O’Grady; M Sheridan, J Gibbons (0-3), J Corcoran (0-3); P Glavey (1-2), F Burns (0-1), JJ Cribben (0-4). Sub: E Campbell for Earley. Fermanagh 2-5 Mayo 1-9 (Irvinestown, 31/10/1971). MAYO: JJ Costello; J Earley, J Mellett, T Keane; J Carey, J Morley, M Begley; S Kilbride, S O’Grady; M Sheridan, J Gibbons (0-3), J Corcoran (0-4); P Glavey (0-2), F Burns, JJ Cribben (1-0). Mayo 0-11 Meath 1-5 (James Stephens Park, Ballina, 14/11/1971). MAYO: JJ Costello; J Earley,R Prendergast, T Keane; J Carey, J Morley (0-1), M Begley; S Kilbride, M Higgins; M Sheridan, J Gibbons, J Corcoran (0-3, two frees); P Glavey, F Burns (0-2), JJ Cribben (0-4). Subs: B O’Reilly for Glavey, R Niland (0-1) for Gibbons, E Campbell for Prendergast. Derry 0-13 Mayo 0-5 (Ballinascreen, 28/11/1971). MAYO: JJ Costello; J Earley, J Morley, R Niland; J Carey, M Begley (0-1), B O’Reilly; S Kilbride, T Keane; P Glavey (0-2), J Gibbons, M Sheridan; J McCormack, F Burns (0-1), M Higgins. Subs: S Healy (0-1) for Gibbons, K Lavelle for Earley. Mayo 2-7 Sligo 0-12 (Crossmolina, 12/12/1971). MAYO: JJ Costello; K Lavelle, , J Morley, R Niland; M Begley, J Carey, T Keane; S O’Grady, M Higgins (0-1); M Sheridan (0-2), S Kilbride, P O’Dea; P Glavey, F Burns (1-1), JJ Cribben (1-2). Sub: J Corcoran (0-1) for Glavey. PRELIMINARY ROUND: Leitrim 1-2 Mayo 3-15 (Pairc Sean Mac Diarmada, Carrick-on-Shannon, 25/4/1971). MAYO: R Cosgrove; B Breslin, D O’Mahony, E Campbell; F Hunt, M Higgins, P Nally; S Kilbride, D Dolan; M Padden, N Farragher, V Kelly; N Maloney, F Burns, W Henry. Subs: K Durcan for Higgins, T Knight for Dolan, N McCarthy for Kilbride. SEMI-FINAL: Galway 1-10 Mayo 2-9 (Pearse Stadium, 18/7/1971). MAYO: JJ Costello; B Breslin, D O’Mahony, E Campbell; F Hunt, M Higgins (0-1, a fifty), P Nally; S Kilbride (1-1, goal from a free), D Dolan; T O’Malley (0-2), N Farragher (1-0), D Griffith (0-3, one free); M Padden (0-1), F Burns (0-1), N Maloney. Subs: M Sweeney for Farragher, F McGrath for Nally. FINAL: Mayo 5-10 Roscommon 0-8 (Fr O’Hara Park, Charlestown, 15/8/1971). MAYO: JJ Costello; B Breslin, D O’Mahony, E Campbell; F Hunt, M Higgins, P Nally; S Kilbride (1-1), D Dolan; T O’Malley (0-1), D Griffith (1-3, three frees), N Farragher; M Padden (2-2), F Burns (0-3), N Maloney (1-0). SEMI-FINAL: Cork 4-11 Mayo 0-5 (Athletic Grounds, Cork, 29/8/1971). MAYO: JJ Costello; B Breslin, D O’Mahony, E Campbell; F Hunt, M Higgins, P Nally; S Kilbride (0-1), D Dolan; T O’Malley, D Griffith (0-1), N Farragher; M Padden (0-2), F Burns, N Maloney (0-1). Subs: N Dooney for Farragher, N McCarthy for Nally. PRELIMINARY ROUND: Leitrim 0-2 Mayo 5-19 (Pairc Sean Mc Diarmada, Carrick-on-Shannon, 4/7/1971). MAYO: M Griffin; J O’Mahony, S Reilly, P McCormick; M Finn, R McNicholas, J Culkin; M Fahy, G Farragher (1-1); M Gannon (1-3), JP Kean (0-3), M Higgins (0-2); N Joyce, M Cunningham (2-3), G Feeney (0-6). Sub: C Moynihan (1-1) for Fahy. SEMI-FINAL: Mayo 1-7 Galway 0-9 (MacHale Park, 11/7/1971). 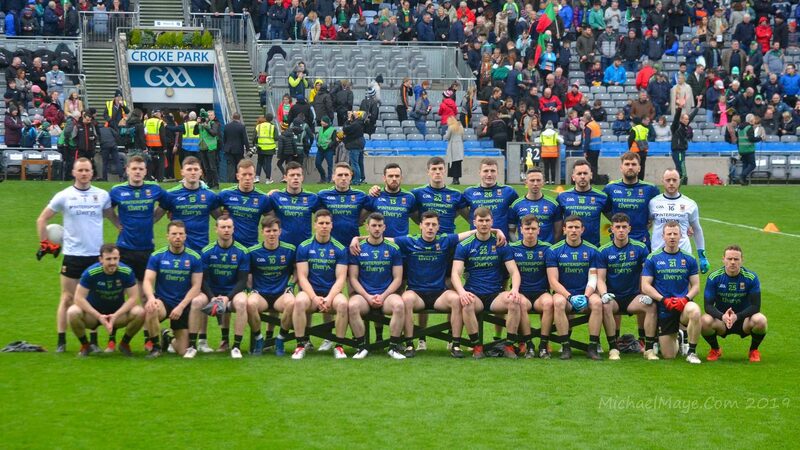 MAYO: M Griffin; J O’Mahony, S Reilly, A Durcan; G Feeney, C Moynihan, J Culkin; G Farragher (0-1), J Quinn; M Gannon (0-1), JP Kean (0-2), M Higgins (0-1); N Joyce (0-1), M Cunnigham (1-0), K Sloyan. Subs: R McNicholas for Quinn, F Harty (0-1) for Kean, M Fahy for McNicholas. FINAL: Mayo 2-12 Roscommon 1-8 (MacHale Park, 31/7/1971). MAYO: M Griffin; J O’Mahony, S Reilly, A Durcan; G Feeney, C Moynihan, J Culkin; G Farragher (0-2), J Quinn (1-1); M Gannon (0-2), JP Kean (0-1), F Harty (1-3); N Joyce, M Cunningham, M Higgins (0-2). Subs: R McNicholas for Cunningham, M Fahy (0-1) for Farragher. SEMI-FINAL: Mayo 3-8 Tyrone 0-13 (Croke Park, 8/8/1971). MAYO: M Griffin; J O’Mahony, S Reilly, P McCormack; A Durcan, C Moynihan, J Culkin; G Feeney, J Quinn; M Gannon (1-3), JP Kean (1-3), F Harty; N Joyce, M Cunningham, M Higgins (0-1). Subs: PJ Flynn for Cunningham, R McNicholas for O’Mahony, M Fahy (1-0) for Joyce. FINAL: Mayo 2-15 Cork 2-7 (Croke Park, 26/9/1971). MAYO: Michael Griffin; John O’Mahony, Seamus Reilly, Adrian Durcan; Ger Feeney, Con Moynihan (0-1), Johnny Culkin; James Quinn, Ray McNicholas (1-1); Michael Gannon (0-3), John P Kean (0-4), Michael Higgins (0-3); Ger Farragher (0-1), Frank Harty (0-1), Michael Maloney (1-1). Sub: M Fahy for Quinn.